SERVPRO of Atlantic City/Hamilton/Hammonton provides 24-hour emergency service and is dedicated to being faster to any-sized disaster in Brigantine New Jersey. We can respond immediately to your Mold related issues in your home or business. Our team has the expertise to handle your Mold Remediation needs. 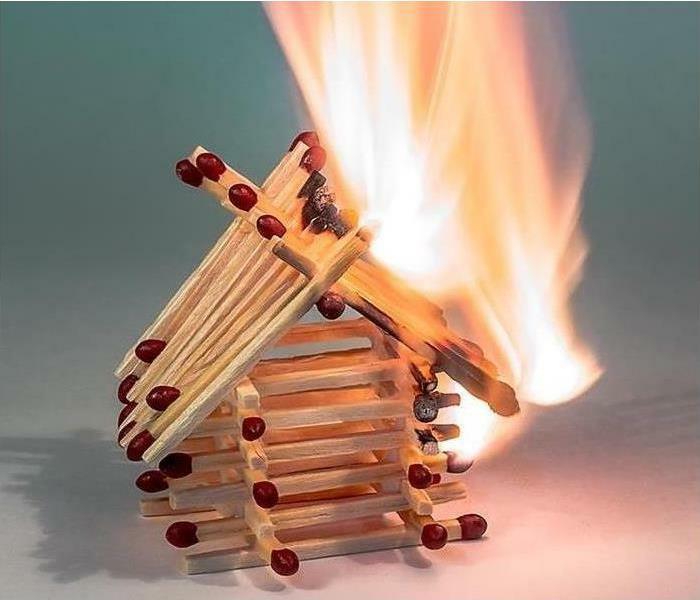 SERVPRO of Atlantic City / Hamilton / Hammonton understands the stress and worry that comes with a fire, water or mold damage and the disruption it causes your life and home or business. Our goal is to help minimize the interruption to your life and quickly make it "Like it never even happened." 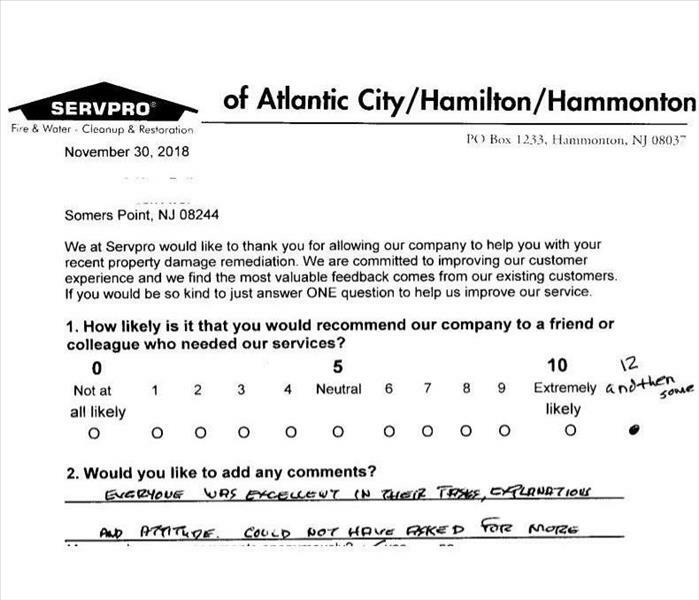 At SERVPRO of Atlantic City/Hamilton/Hammonton our staff has decades of water damage remediation experience. Sometimes we have to get creative in our approach to drying your home or business. At this Brigantine New Jersey home a frozen pipe on the 2nd floor caused significant damage to the entire home. among the ares that sustained water damage was the crawl space. In order to dry this area we had to duct the our dehumidifier into the crawl space. Do you Suspect Mold in Your Brigantine NJ Home? Seashore homes frequently have mold issues. Between the damp environment and the fact the home may go unoccupied for weeks at a time can lead to mold issues at coastal properties in New Jersey. 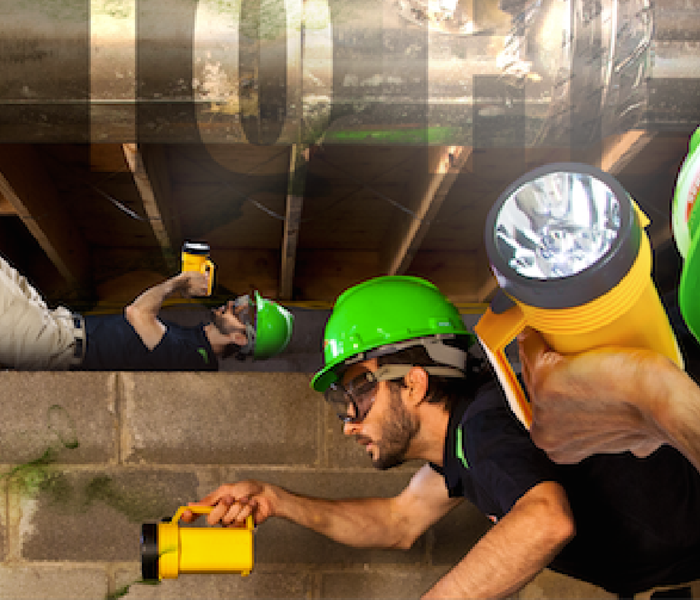 Attics, garages and especially crawlspaces can be most susceptible to mold issues. SERVPRO of Atlantic City/Hamilton/Hammonton is here in your community and Here to Help®. We have teams of certified professionals that are ready to help when disaster strikes. Our crews are certified in water damage repair and fire damage repair. We also have certified teams to assist in mold remediation. When the storms strike Southern New Jersey, we are ready to deploy our storm damage teams. Whatever you’re facing, we are faster to any size disaster. 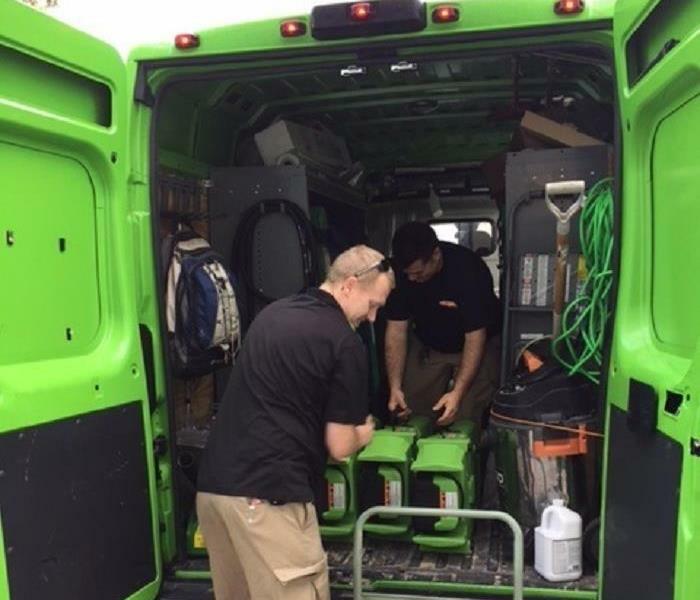 As a locally owned and operated business, SERVPRO of Atlantic City/Hamilton/Hammonton is strategically located to respond quickly to your water or flood damage loss. From the time our crews arrive on site to the time they pack up equipment, you will be kept in the loop of what’s happening in your home or business throughout the entire restoration process. This foundation assists the Atlantic County Special Services School. 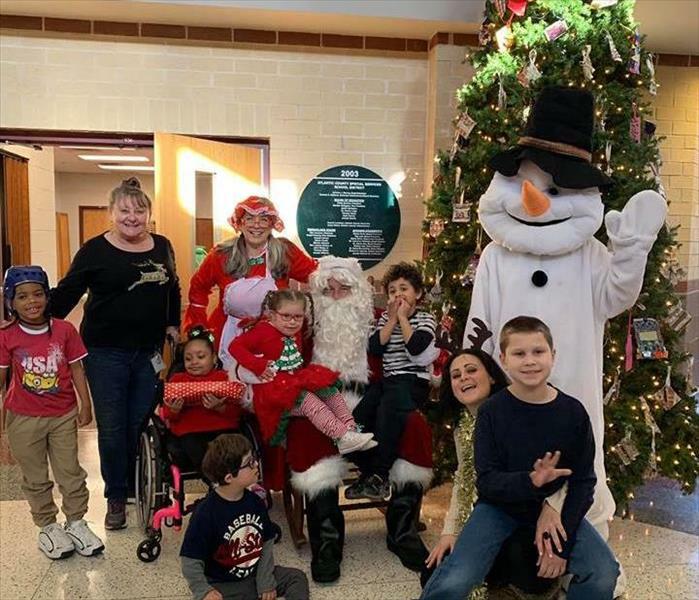 In addition to a visit from Santa clause who provides a gift for each student, the foundation assists in providing funding for items or services that are not in the schools budget. Members of our management team always accompany Santa on his visit to the school and it is always a day that puts a smile on everyone's face. To be just a small part of this organizations giving is special to us. At SERVPRO of Atlantic City/Hamilton/Hammonton we live and work in the community and are proud to support the community. A portable fire extinguisher can be a life and property saving tool when used properly. but which one is best for your home or business? Class B: Used for fires involving flammable liquids such as grease, gasoline and oil. Class C: designed for fires involving appliances, tools, or other equipment electrically energized. Class K: Intended for use on fires that involve vegetable oils, animal oils, or fats in cooking appliances. 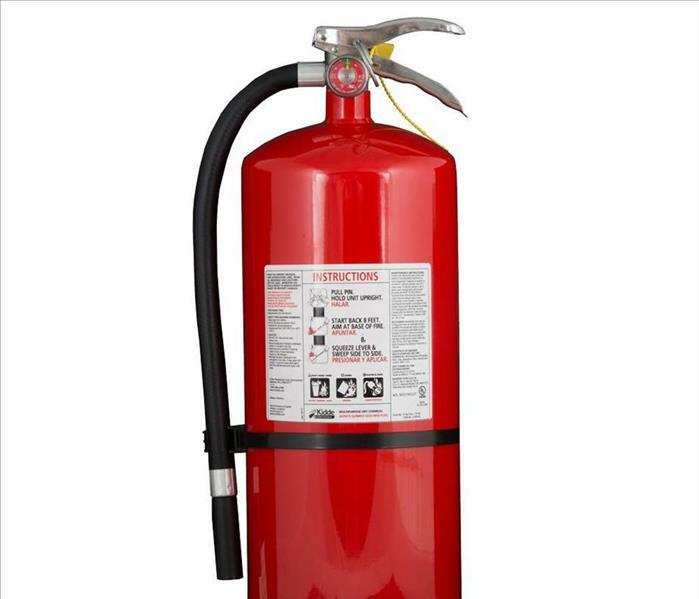 these extinguishers are generally found in commercial kitchens, but are becoming more popular in residential market for use in kitchens. When fire and water damage puts the things that matter most on the line, you need to very best help on the line as well. SERVPRO of Atlantic City/Hamilton/Hammonton is just a call away 609-965-0885. The frigid temperatures of the winter months pose the potential to cause serious damage to your business. 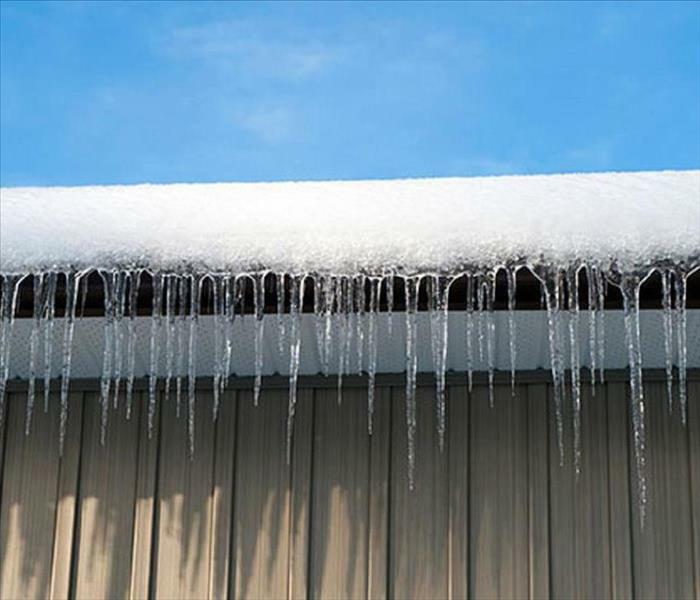 Not only is your business at risk of water freezing and bursting pipes, but the roof of your business is susceptible to water damage due to the formation of ice dams, and damage from snow accumulation. Broken pipes pose a common and costly issue, but ice dams and snow accumulation also carry a serious damage risk. Ice dams form at the edges of the roof when the heat in the attic causes snow on the roof to melt, which in turn refreezes at the gutters. Regularly cleaning your gutters and properly insulating/ventilating your attic help reduce the risk of forming ice dams. In addition to routine gutter maintenance in the winter, it is important to clean off your roof when snowfall has accumulated over 6 inches. This will help prevent heavy snow collapsing your roof and costly damages occurring inside of your business. Be careful to stay on the ground when attempting to clear your roof, otherwise, hire a professional to clear it for you. These types of retroactive maintenance on your business give you as a business owner the best odds of making it through the winter without issue. However, should you find yourself in a jam due to unexpected winter damages this upcoming season, SERVPRO has your back. SERVPRO of Atlantic City/Hamilton/Hammonton provides 24-hour emergency service and is dedicated to being faster to any-sized disaster. We can respond immediately to your storm-related issues in your business or business. Our team has the expertise to handle your storm damage needs. SERVPRO of Atlantic City/Hamilton/Hammonton understands the stress and worry that comes with emergency damage and the disruption it causes your life. Our goal is to help minimize the interruption to your life and quickly make it "Like it never even happened." Thermal Imaging Helps Detect Water Damage in this Medford, NJ Home. State of the art tools such as thermal imaging is essential for detecting water damage and moisture in a home of business. We can quickly identify wet materials. This allows us to determine a complete and accurate scope of damage. SERVPRO of Atlantic City / Hamilton / Hammonton provides 24-hour emergency service and is dedicated to being faster to any size disaster. Our highly trained technicians can respond immediately to your residential or commercial emergency. We handle water damage, fire damage, mold remediation, storm damage and commercial services. For all of your property restoration needs SERVPRO of Atlantic City/Hamilton/Hammonton is available 24/7/365, call 609-965-0885. SERVPRO of Atlantic City / Hamilton / Hammonton understands the stress and worry that comes with a fire or water damage and the disruption it causes your life and home or business. Our goal is to help minimize the interruption to your life and quickly make it "Like it never even happened®." This client was so happy with our service he rated us a "12" on a scale of "1 - 10". When Matt from Somers Point was referred to us by his HVAC company his basement had a significant mold issue from an undetected leak. SERVPRO was able to work with an Indoor Air Quality (IAQ) expert to establish the extent of the damage and establish work plan. Our remediation was completed in a timely manner, and passed post remediation testing. 2/12/2019 - Do you Suspect Mold in Your Brigantine NJ Home?